Korean | poor scientist. will blog 4 food. This sign was actually really helpful. I love insider tips. So, when my friend JL said she knew about a Korean place specializing in noodles, specifically jajangmyeon or soy bean noodles (zha jiang mien in Chinese), I was there. Lunch Time restaurant (Joongmi in Korean) is oddly located in the basement of an office building in Annandale, VA. As we settled into the cafeteria-like setting, I felt like a real insider. There was a giant placemat/menu full of yummy Korean food and it was all so reasonably priced! We each ordered our own bowls of jajangmyeon, and also ordered some spicy rice stick to share. For those who don’t know, jajangmyeon is a dry noodle dish topped with a thick soy bean sauce usually with meat and tofu. The Chinese version also comes with julienned cucumbers and carrots. Even though the sauce looks dark, it’s actually not very salty. This bowl of jajangmyeon was great — the noodles were al dente and the sauce was flavorful. The bonus? We either got a special Korean discount (we had two Koreans among us) or the waitress made a big mistake, but it ended up being only $6/person after tax. We gave our server a huge tip! 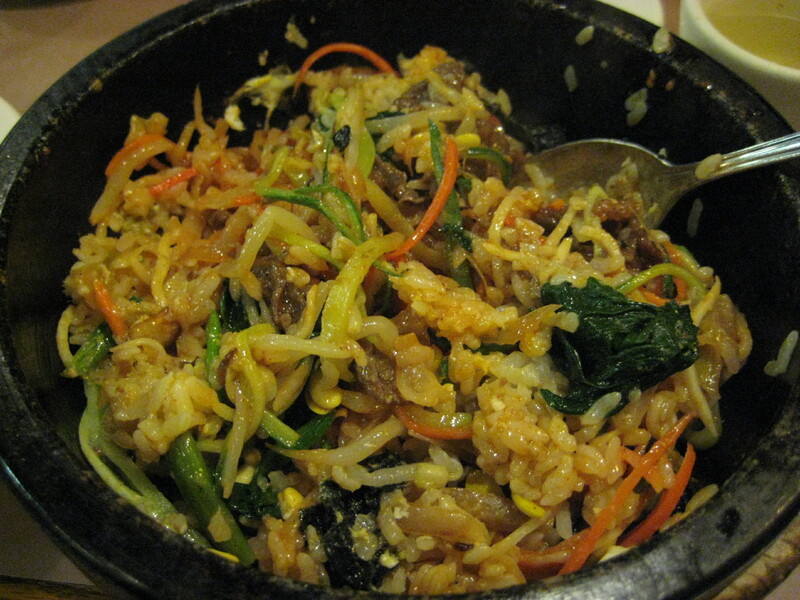 Categories: noodles, photos, restaurants | Tags: Korean, noodles, Virginia | Permalink. A quick entry before I head off to the Thanksgiving feast! 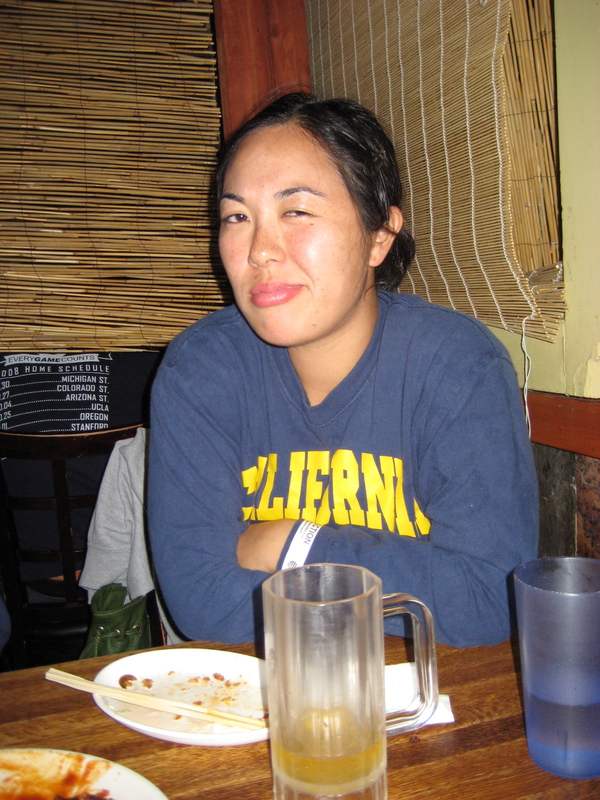 Sunday, after a long hike, SB and I were starving. 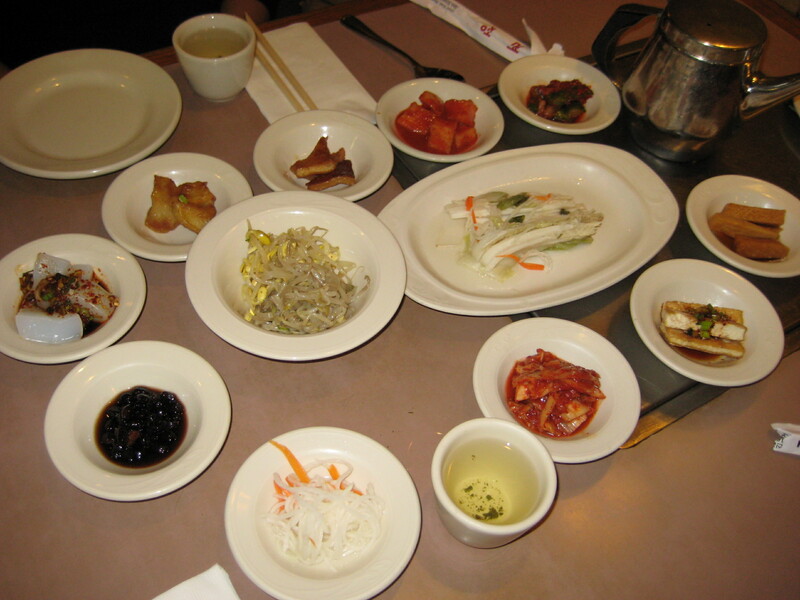 We headed to Korea House in the Japantown area of San Francisco. I was up for a full Korean meal, since I had only satisfied the fried chicken portion the night before. 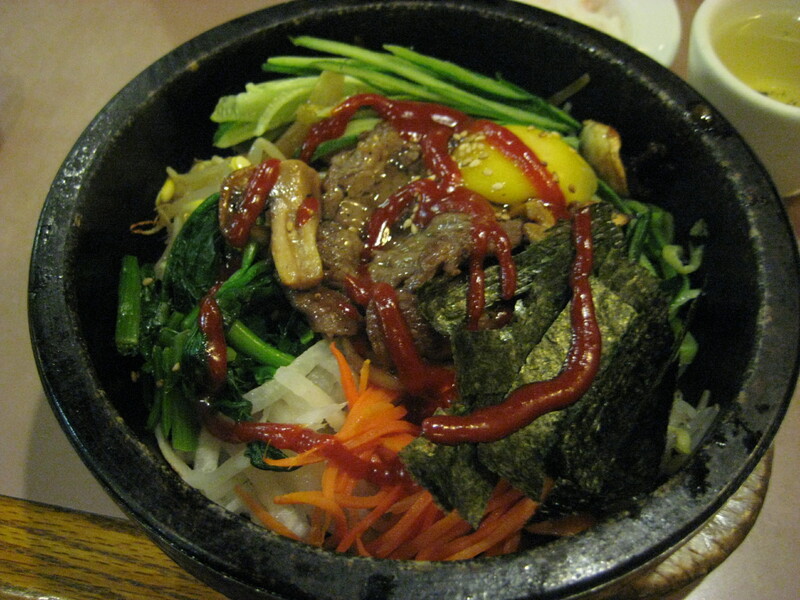 We both ordered dolsot bibimbap — a rice dish that comes in a clay pot. (Wikipedia has a great description of the dish). 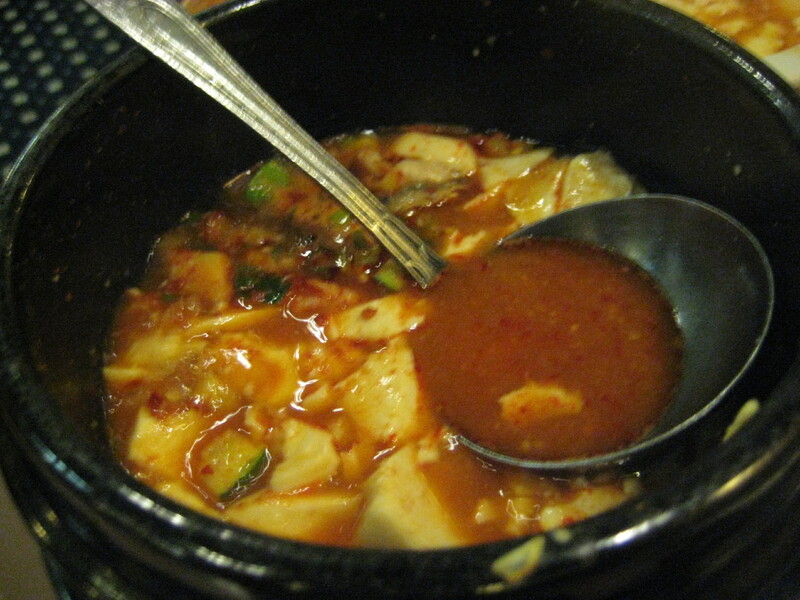 We also shared seafood tofu soup and lots of little appetizers, one of my favorite things about Korean restaurants. It’s a good thing we were hungry — it was a lot of food! After mixing. Sort of like Korean fried rice! Seafood tofu soup. Nice and spicy. Scraping every last tasty morsel from the claypot. 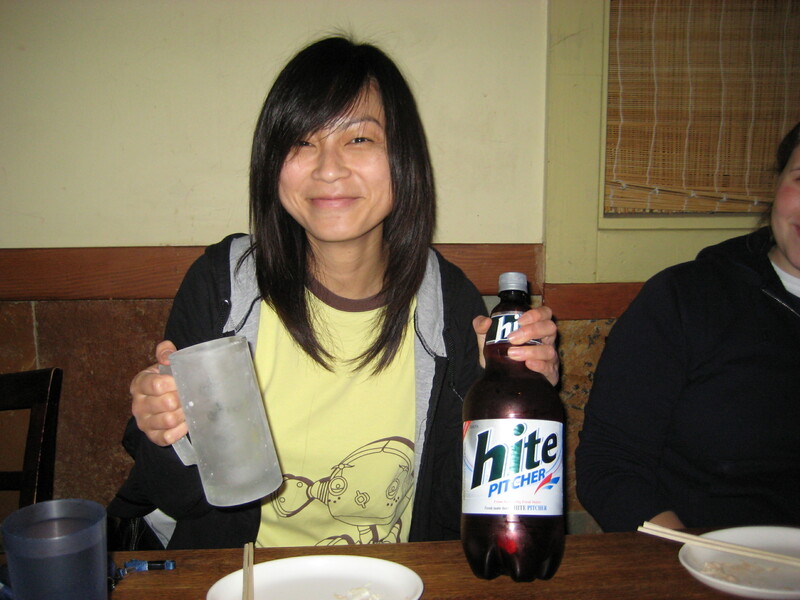 Categories: photos, restaurants | Tags: Korean, photos (food), San Francisco | Permalink. This just might be my most prolific blog week ever. I’ve got a backlog of material and then Thanksgiving’s coming up… I hope you’re all ready for lots of food photos! A couple of years ago, I read about a food trend that definitely got my attention (and my stomach rumbling): Korean fried chicken. Apparently, this stuff was supposed to be what all fried chicken strives to be: juicy, flavorful meat surrounded by crunchy (but not too tough) breading. I forgot all about this until I was talking to JL a couple months ago and she told me of a restaurant in Oakland that serves this mysterious delicacy. Well, I don’t know why it took us so long to experience Korean fried chicken, but we finally got around to it this past Saturday. 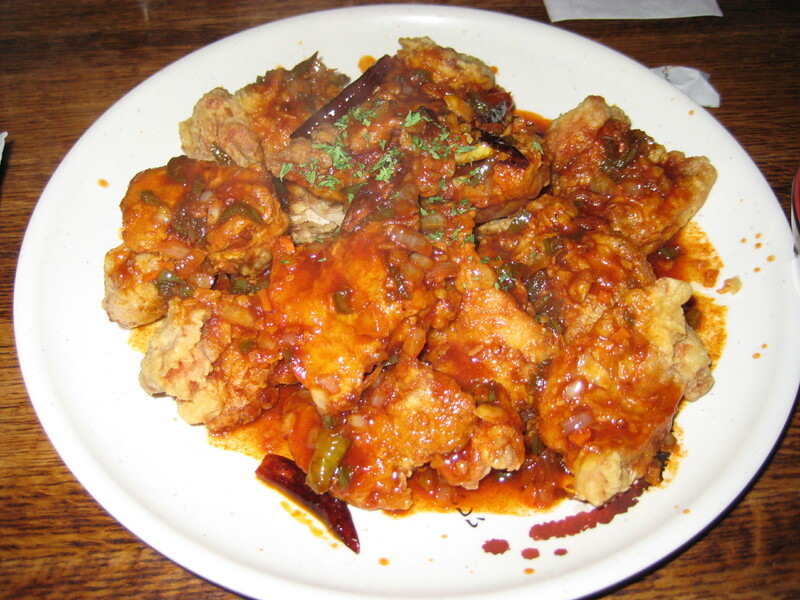 Oriental BBQ Chicken Town (no joke — that’s what it’s really called) is located in North Oakland, ironically between a KFC (Kentucky Fried Chicken) and RFC (Rockridge Fuel Center). 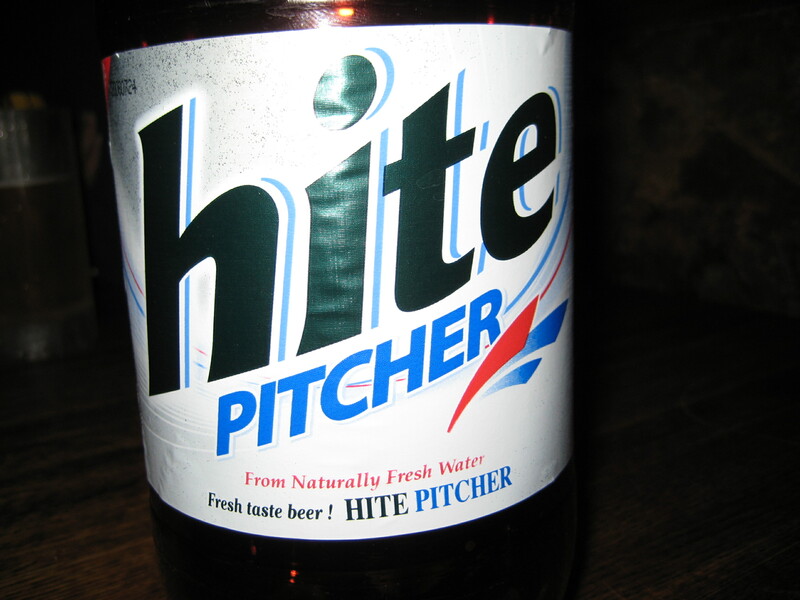 Unlike the other Korean restaurants I’ve gone to that offer traditional meals, OBCT serves the equivalent of Korean bar food — fried snacks to accompany copious amounts of soju and beer. With four friends in tow, we ordered 3 huge plates of fried chicken and one order of garlic fries. No veggies, no noodles, nothing. We were serious about our chicken! A beer about the size of my head... and frosted beer mugs. Bonus! Upon closer inspection... Fresh taste beer! The original recipe. Comes with cabbage and mustard. Spicy & sweet fried chicken hot out of the fryer (check out the steam). 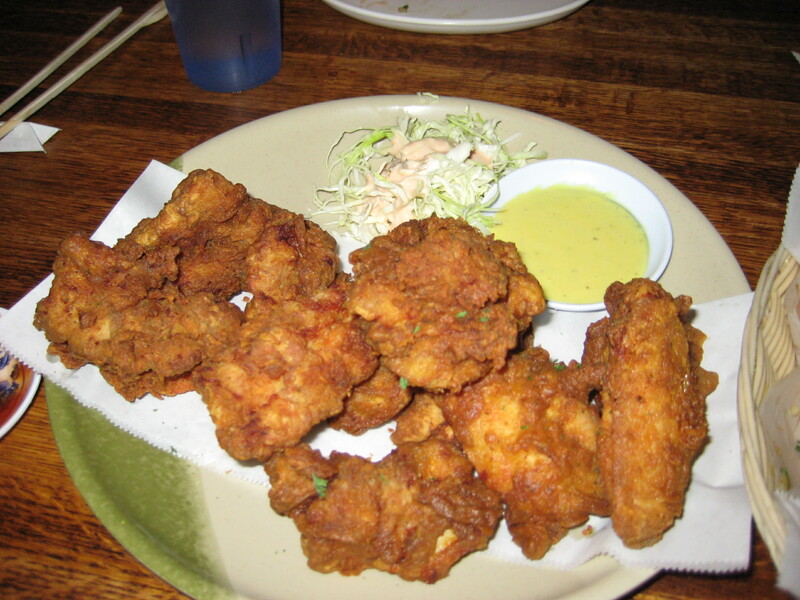 Garlic and soy fried chicken, also with cabbage. So what’s the verdict? Korean fried chicken is the bomb. It wasn’t the best fried chicken I’ve ever had, but it’s definitely up in the top 5. Also, I enjoyed the different variations. I think the garlic and soy was my favorite. Another bonus is that most pieces are boneless so it’s easier to eat. 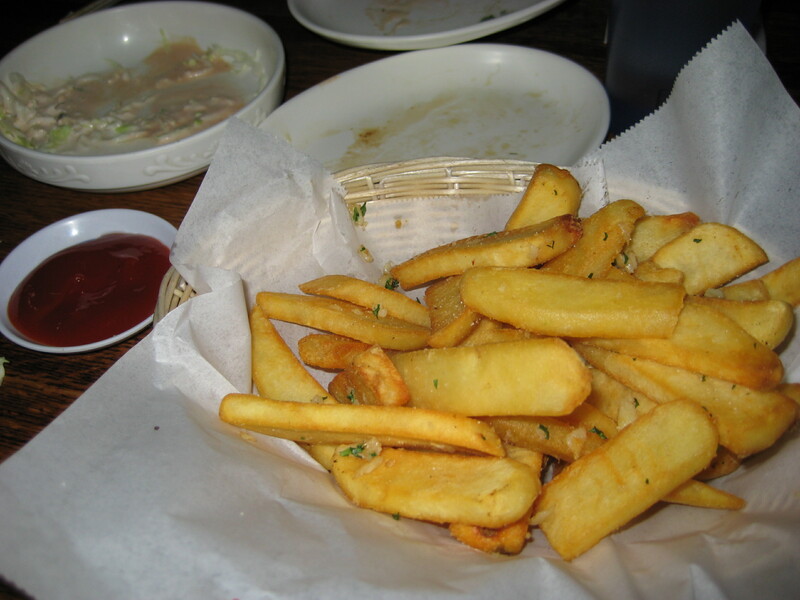 Interestingly, they fry with olive oil, so at least I wasn’t clogging my arteries with partially hydrogenated oil. The downside? I think we should have ordered some more non-meat items. Next time, rice stick (thick noodles covered with red sauce) will definitely be on my list. My fellow diners and I all scarfed down the first few pieces of chicken. Around piece #5 or 6, we came to a halt. We arrived at what I term the “meat ceiling.” It’s when you can’t swallow another bite of meat… even though you might still be hungry. 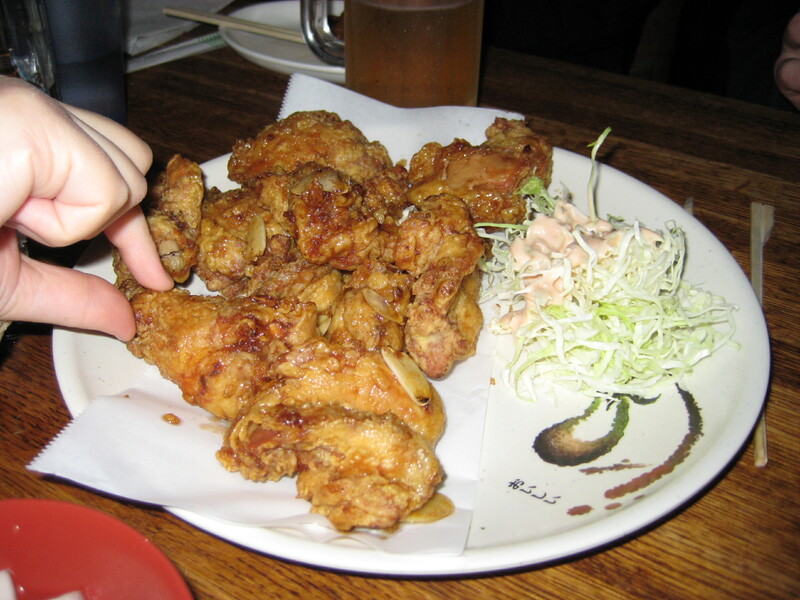 Categories: photos, restaurants | Tags: fried chicken, Korean, meat ceiling, Oakland, photos | Permalink.